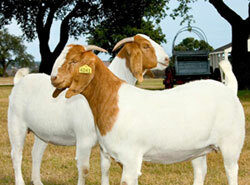 The American Boer Goat Association has been the premier registry since the Boer goat came to the United States in 1993 . One of the dreams of the first ABGA Bard of Directors was to implement a program to recognize the best of the best, the fullblood bucks and does in the United States who, along with their Progeny, best exemplify outstanding breed qualities as measured against the American Breed Standards developed by the ABGA. Policies and procedures were drafted in 1995 and approved in 1996. Subsequent Boards, including several committees, labored for another two years in the development of the criteria and procedures for an Ennobled Herdbook. Several breeders from South Africa validated the merit of this program and contributed ideas toward its construction. Now the cream has risen to the top in the American Boer Goat Association. After there years in the planning and two years spent developing strategy, the Ennobled Herdbook has identified four Boers who have met the strenuous criteria and earned the right to a new certificate declaring each an Ennobled Buck/Doe. The four Boers to attain this prestigious recognition are Kaptein, Tabu, Ubora and 519. Kaptein (buck) was owned by Don Smith of Talpa, Tx, Norman Kohls of Eldorado, Tx, and Paul Payne of Robert Lee, Tx. Kaptein died a few years back, but his progeny's points have brought him forward into the Ennobled Herdbook. Claire Powell, Eldorado, Tx, and Sharon Holman, Sonora, Tx, Powell~Holman Ranch, are the owners of Tabu. He is now deceased, but during his lifetime he accumulated many points in the show ring and now his off-spring are following in his footsteps. Dowen Livestock Co., Early, Tx, is the proud owner of both Ubora (buck) and 519 (doe). Ubora was bred by A.P. Venter and 519 was bred by Downen Livestock. To obtain the distinguished title of Ennobled, a fullblood or purebred Boer Goat must meet or exceed the following criteria: A Boer goat must pass visual inspection and earn a total of eighty (80) points, with no less than thirty (30) of these total points having been earned by combining points from at least three (3) of his/her progeny (sons/daughters) and the progeny must passed visual inspection. Non-inspected Boer goats can achieve Ennobled status through their progeny, when at least three (3) of the progeny have earned a combined total of one hundred (100) points and have passed visual inspection as certified by the ABGA Secretary. These points may be earned through the show ring or through performance tests. ABGA will be announcing more ennobled goats in the near future. There are several bucks/does that have met most of the criteria to be placed in the Ennobled Herdbook, however, their progeny have not been visually inspected. Fullblood/purebred Boer bucks and does who attain registration into the Ennobled Herdbook provide breeders with visual definitions of the Breed Standards. The Ennoblement program is meant to provide a direction and incentive for the continual improvement and growth of the Boer goat. The ABGA has always been dedicated to the improvement of the breed, education of the public and the promotion of the Boer goat. The ABGA is giving their membership what they want - timely and affordable registrations, sanctioned shows, education and the promotion of the breed. Ennobled Johaan was purchased by Powell~Holman from Alan Balson. He is from the Bloem herd in South Africa. Tremendous length, bone and width best describe Johaan. His physical characteristic earned him three Grand Championships under three different judges: Frank Craddock, Preston Farris and Don Smith. His prodigy continue to prove themselves as studs across the nation, as well as being winners in the show ring. Ennobled Kaptein was purchased in South Africa from Andrew Jordan and imported by Jurgen Schultz for CODI/PCI. Tolli Jordan and I were looking for a super herd sire because the goats were to be in quarantine for five years. He was really tough in skeleton and expressive in muscle, but what really improved with age was the extreme length, evident in his mature photos. It is this skeletal extension, big flat bone, and superb growth rate that identifies him. Don Smith, Paul Payne, and I bought and owned him until his untimely death. His prepotency has left a legacy of great offspring to linebreed his genetics. There have been few studs in any species, but he will always be remembered as one. My thanks to Andrew Jordan, Tollie Jordan, Jurgen Schultz, Don Smith, and Paul Payne, for sharing a piece of this super sire with me. Continue to look for his legacy through our genetics. Ennobled Tamu was purchased by Powell~Holman from Alan Balson in Canada, who imported her as a frozen embryo from the Bloem herd in South Africa. She was selected for three reasons: She was Johaan's sister, who they knew was a strong breeder; she had tremendous bone and body capacity, and her offspring were consistently top quality. Ennobled Tabu proved himself in the show ring when he won National Grand Champion Boer Buck at the 1997 ABGA as National Reserve Champion Boer Buck at the same show, affirming his ability as a stud sire. Colossal muscling and excellent conformation best depict Tabu. He was purchased by Powell~Holman from Alan Balson. His breeding is DuToit and Van Rensburg from South Africa.